"Easy, best ever garlic Italian chicken! If desired, serve with plain white rice and a green vegetable such as broccoli or green beans." In a large skillet, brown the chicken pieces in oil and cook for about 15 minutes over medium heat. Crush garlic cloves and squeeze over chicken. Cover skillet and cook over low heat for 10 minutes each side. Remove cover, sprinkle with red pepper flakes and salt to taste, add water and simmer over low heat until water evaporates and the chicken pieces are sticky and yummy! Discover a terrific shortcut to flavorful Italian-inspired baked chicken breasts. This was so easy and excellent! 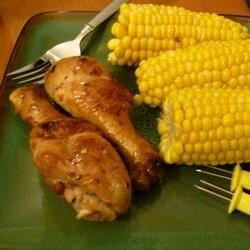 For a little added tang, I rubbed the chicken with lemon pepper and added lemon juice with the 1/2 cup of water. Absolutely great!!! We loved this recipe. There are no kids here but we enjoyed it. It might be a little to spicy for children but mouth watering for adults.